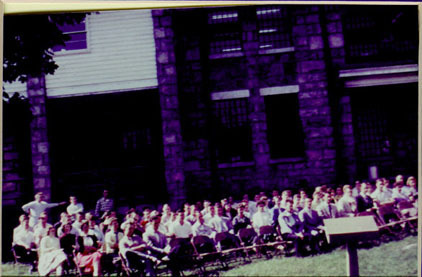 Photograph of Clinch Valley College at opening day ceremonies. 1954. For one hundred years University faculty and administrators remained indifferent or hostile to the extension of educational programs beyond the grounds in Charlottesville. In 1912 a few faculty agreed to lecture outside the area. A director of extensions services was appointed and the first credit course offered in 1919. The Extension Division, under George B. Zehmer, reached out to every area of the state in the 1930s and 1940s offering class work, extracurricular programs and home-study courses. Nowhere was the need greater than in remote and poverty-stricken southwest Virginia where a tiny extension branch was unable to meet the demand for post high-school education. A group of determined citizens, with the enthusiastic support of University President Colgate W. Darden, campaigned in the Virginia General Assembly for funding and were granted an appropriation of $5000. Local businesses, clubs, and stores more than doubled the amount. Wise County transferred the land previously occupied by a local poor farm for $1.00. 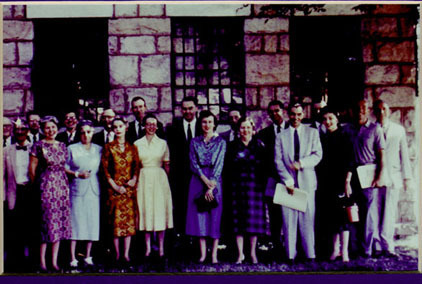 The first students, men and women, enrolled in September 1954. Clinch Valley became a four-year college in 1968 and awarded its first baccalaureate degrees two years later. In 1998 the decision was made to formally rename the college the University of Virginia's College at Wise. Photograph of the first faculty. 1954.